Feel a little like royalty on your private beach-bed/cabana. No crazy curly slides or spouting turtles - it's not that kind of pool. It's more the type where you casually wave someone over when you're ready for a drink. Striking dark wood accents offer a nice counterpoint to the bright whites. Flip through all those issues that have been piling up at home, glass of wine in hand. The sophisticated style starts in the glam lobby and doesn't stop. Located along gorgeous white sand beaches. Your kids will love the children's pool and children's club! You're just a 7 min drive to Casa de Campo Golf Course Guest House and a 4 min walk to Club de Golf Fontaur. Relax with a drink at the poolside bar. Effortlessly stylish without being overly trendy, the beachfront Cabo Azul Resort by Diamond Resorts delights with glowing fire sculptures, playful waterscapes, and dramatic interiors. The resort goes all-out in the pool department. There’s a tri-level oceanfront infinity pool and an adults-only serenity pool. Visit the swim-up pool bar often enough to get on a first name basis with the servers, or grab a poolside cabana and lounge with a magazine while the kids splash around in the children’s pool, for ages four through fourteen. When it’s time for lunch, check out the on-site Mexican restaurant, Javier’s. If you’re up for some me-time, let the kids hang out at the children’s club where they will be occupied with fun activities (charges may apply). The children’s club features morning, afternoon and evening sessions. Drop off the kids and head to the well-equipped fitness center for a workout or the full-service spa. Treat yourself to a massage, body treatment, or facial. Spacious condos are a dramatic contrast of dark wood against white walls and furnishings, and all condos are air-conditioned. One- to two-bedroom condos and three-bedroom penthouses sleep four to six guests. Full kitchens allow you the freedom to make your own meals. Keep dinners low-key with family favorites around the table, or gather up plates and head out to your private balcony or patio. Flat screen TVs with DVD players are perfect for family movie night (good thing you remembered to pack the kid’s favorite movies!) Have everyone change into their PJs, pop some popcorn and gather the family in the living room. First kid on the couch picks the movie. The last thing you want to do when you get home from vacation is laundry. Good news! The resort has on-site laundry facilities available. Do a load or two before packing up to home. If your crew is feeling daring, take them horseback riding on the beach, or parasailing out over the water for a day they’ll be talking about for a very long time. Take advantage of the private beach cabanas. Relax with the family, work on your sun-kissed look or help the kids build a sandcastle. The resort is across the street from Plaza del Pescador, a shopping plaza with a variety of unique shops. Tiki Lounge sells Tommy Bahama. Get a new swimsuit at Mare Mio Beachwear. Check out the jewelry selection at Solid Silver. When you get hungry, try the authentic Mexican-style seafood at Fish & Grill or sushi at Spicy Tuna Sushi Bar. Get your caffeine fix at Gloria Jean’s Coffee, and treat the kids to ice cream at Gelateria Per Tutti. If you’re up for a unique experience, visit the Fish Therapy Day Spa. Known as a “facial for your feet,” Garra Rufa fish will eat the dead skin off of your feet, revealing smooth skin. 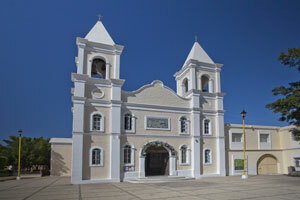 If you're looking for a relaxing vacation destination, San Jose Del Cabo is the place for you. Swim with the dolphins, scuba dive and kayak. Play a round of golf at one of Palmilla Golf Club's three nine-hole golf courses. If you're in the mood for shopping, visit Plaza Artesanos where you can purchase unique jewelry, clothing and pottery.